If you are like me, then vibrato has not been the easiest thing to learn, teach or practice. Occasionally, I have had a student figure out the coordination and pivot points of vibrato in a matter of weeks but that is the exception and not the norm. For most of us, the skill of vibrato seems to have a particularly long and jagged learning curve. 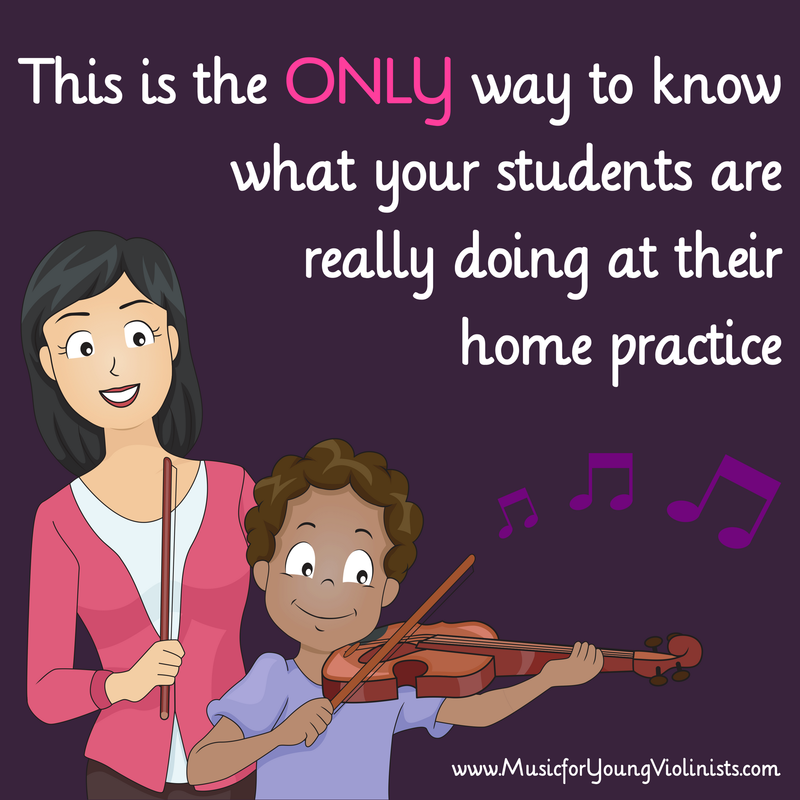 Further impacting this is that the beginning stages of vibrato feel so awkward that it discourages students from following up their assignments during home practice delaying the development of this skill. I don't claim to have any magic wands to substitute for daily practice, devotion and desire - these things are all part of the process and have to be intrinsically motivated. I do however have an approach to teaching vibrato that may help unlock this skill for some of the violinists on this newsletter list. Over the years of teaching, playing and working thru overuse injuries, I often reflected on how unnatural playing the violin is - we defy gravity by holding it up and then make it asymmetrical by putting it on the side. It occurred to me that the reason vibrato is taught much sooner to cellists than violinists is that cello players do not have these 2 issues opposing ergonomic body movements. With a few adjustments, we as violinists can replicate this symmetry and work with gravity by sitting down and starting our vibrato exercises in "cello" position. 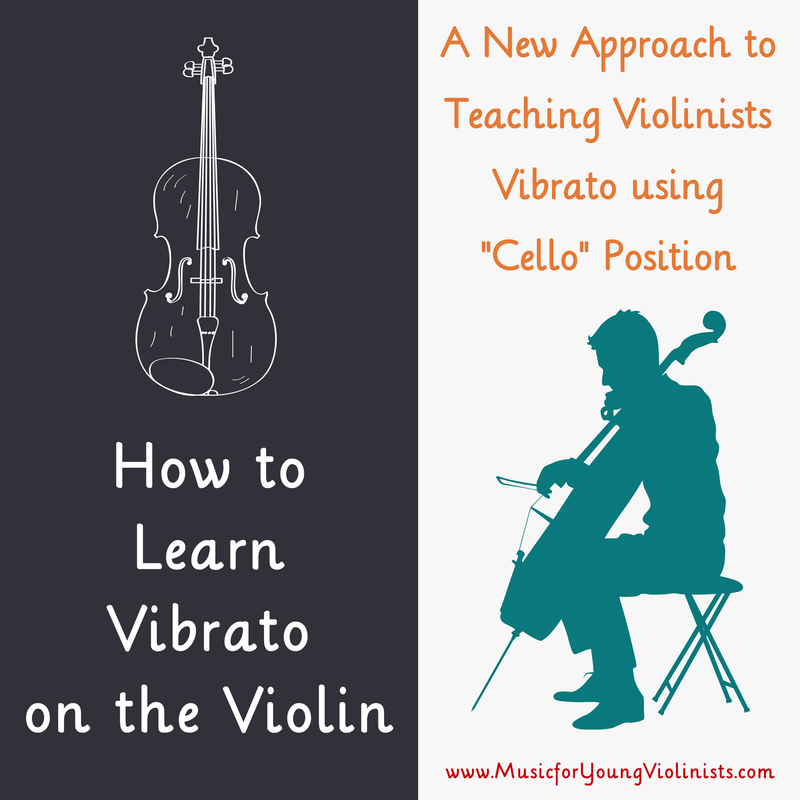 If you are struggling to master your vibrato or dissatisfied with your teaching protocol or just in love with learning, you may benefit from the approach to teaching vibrato using "cello" position demonstrated in more detail on this video. Also included in this video is a successful way to relay vibrato skills to younger students using the power of story telling so they can be independent and accurate in their home practice. Are you seeking more support in your home practice routine or more tools in your teaching toolkit? 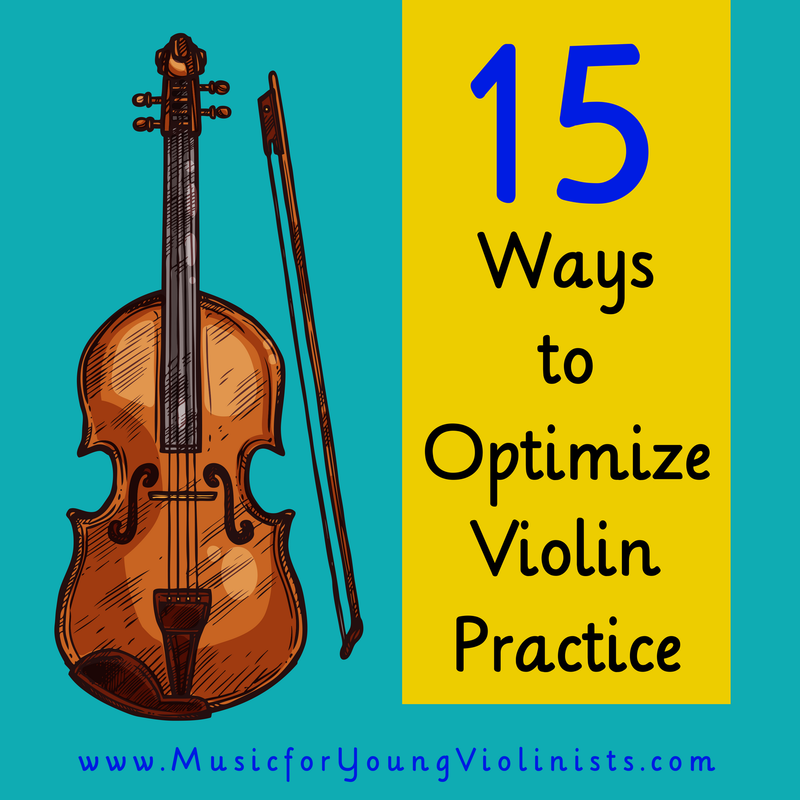 Be sure to check out my video/blog post and free PDF download 15 Ways to Optimize Violin Practice HERE. If you have followed this project for a while you may know that one of the most profound things I ever did in my teaching career was to spend a week watching my students practice. You can learn more about what I discovered and how it was arranged here on The Practice Experiment. 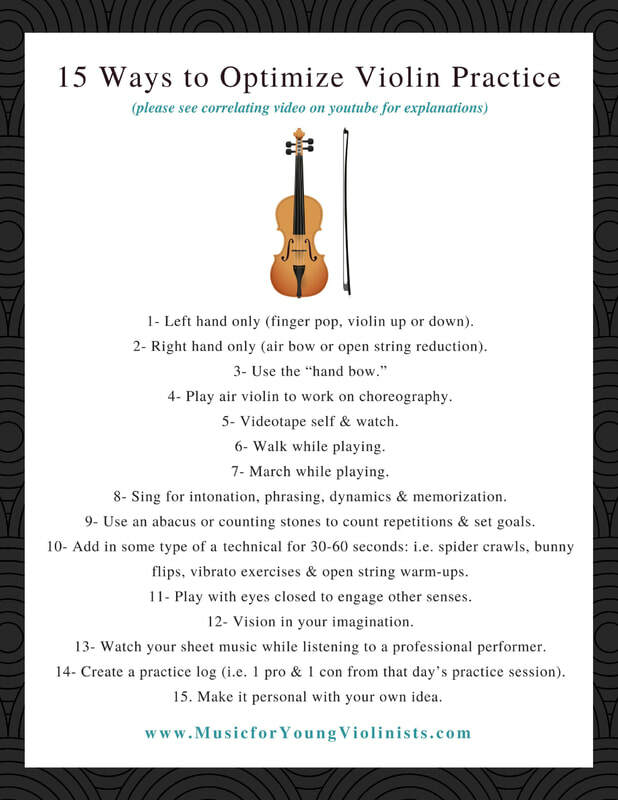 The 15 Ways to Optimize Violin Practice list and correlating video was created as a response to watching my students practice. Too often students were working hard but not progressing as far as they should because they were not practicing the right way. This list and video will help any violinist make better use of their practice time and reach their goals more efficiently. Students - you can use this to help you practice more efficiently. Practicing smarter will help you progress faster. My passion is taking my 20+ years of teaching experience and helping you know the fastest path to success thru the trials and errors I had working with students these past 2 decades. Print out the list below and keep in your violin folder as a reference. Please note, some things on the list may not be clear to you until they are demonstrated in the accompanying video. Learn about 5 surprising items from the hardware store that can all be used to help teach the violin. 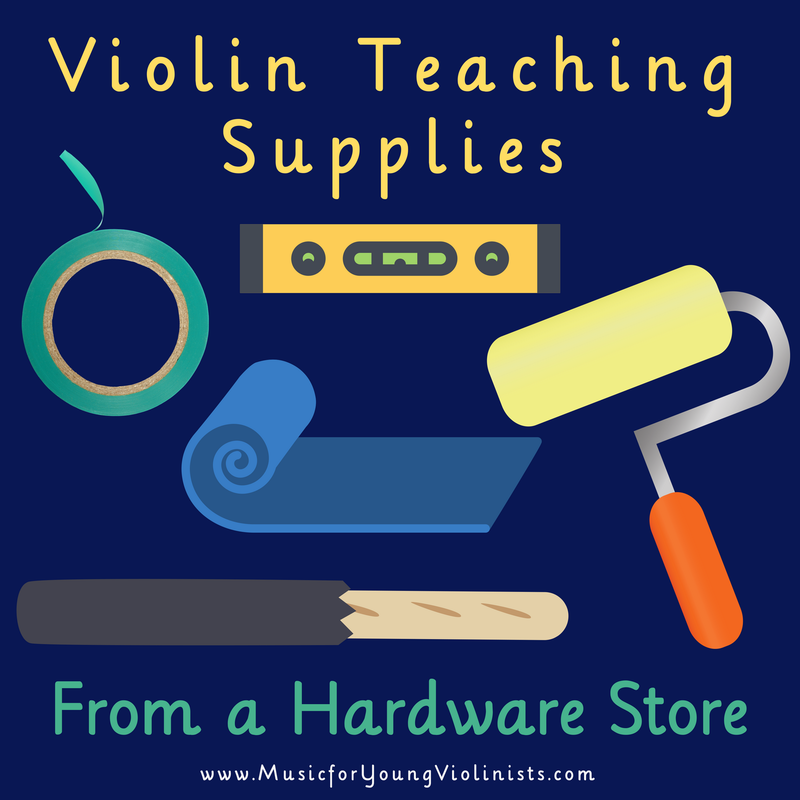 Many of you are preparing for a new school year and this list shares 5 surprising items that you can purchase from the hardware store and use as violin teaching supplies. The bigger message than the specific 5 items on this list is to think outside the box. This will keep your creative process activated as the violin teacher and will keep the learning process fun and exciting for the violin students. The correlating video demonstrates how to use these supplies for teaching the violin in more detail than the list below. 1- Painters Tape - A Violin Teacher’s Best Friend. Use easy to remove and non-residue marking painters tape to be respectful hanging signs in the spaces you rent. Painters tape can also be used to keep young children safe by marking off staircases or other areas you do not wish for them to go in. When performing use it make rows on the floor so your students know where to stand and you save time setting-up. Cut into strips to use as fingerboard finger tapes. Use rubberbands to secure a new, foam paint roller onto the front of the violin to create a tunnel for the bow to go thru. 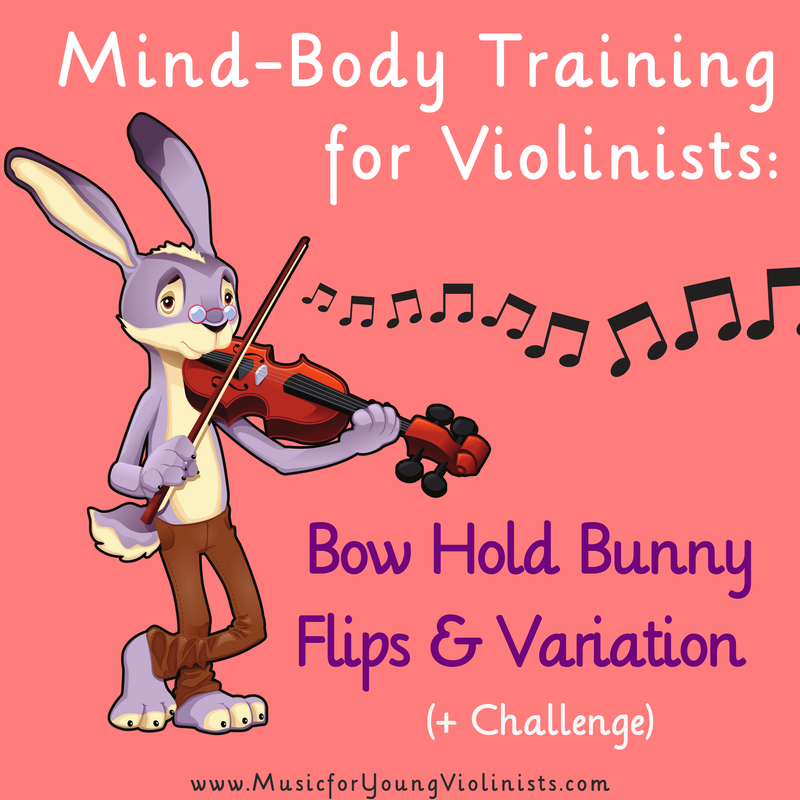 Have the student use this defined track to train the muscle memory for the bow arm and bow hand to learn how to play violin with a straight bow. A level makes it fun to teach young beginners how to keep their instruments up high enough and gives parents a tool for using at home to train this technique when practicing with their child. You can purchase pocket size levels that are 3 inches long for under $1. Using a bathmat for foot charts is better than cardboard because it keeps young wiggling students safe with the non-skid surface. Bathmats are also a great idea for foot charts because they can be used over again with new students which conserves your teaching energy. I forgot to add the paint mixing stick on the video but these are great to make the fingerboard of a box violin for pre-twinkle level students. What creative items do you use in your teaching? Please share in the comments below, thanks! Music Mind Games is a music theory curriculum created by Suzuki Piano teacher Michiko Yurko and involves a series of colorful materials and progressive games for teaching music theory to children. The entire curriculum is one of the best I have ever seen for effectively teaching complex concepts in natural ways that are developmentally appropriate for children. 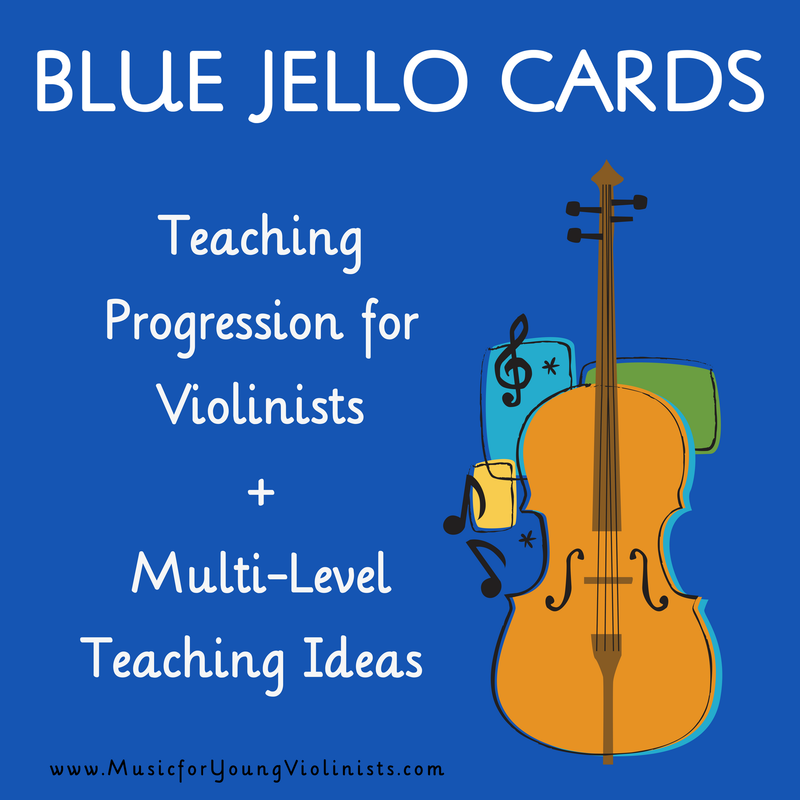 As I progressed in my violin teaching career the reality of limited time pushed me to narrow my music theory offerings and the one thing I kept teaching consistently from the vast Music Mind Games curriculum was the Blue Jello Cards used for teaching rhythm note reading. 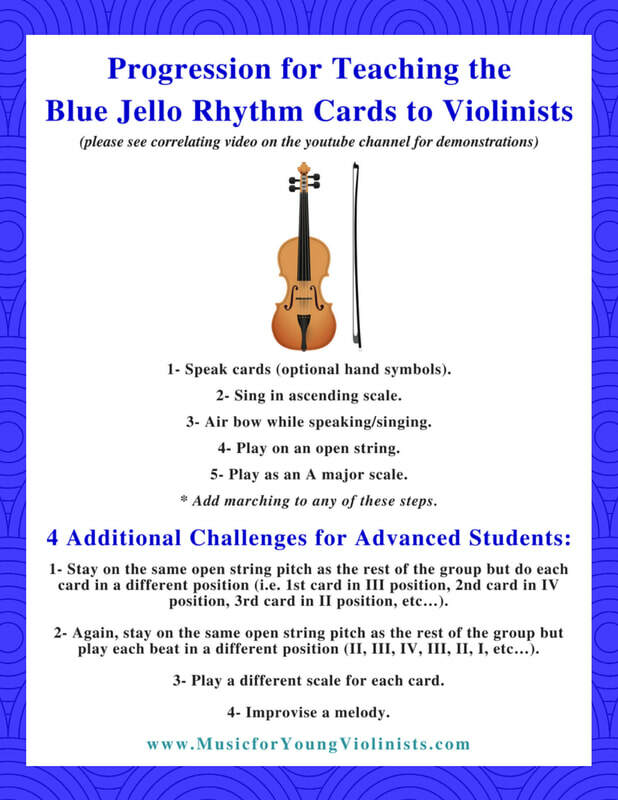 I developed a 5 part approach for using these for violinists and also 4 challenges to engage and integrate my more advanced students in multi-level teaching situations. On a fun, personal note I credit the effectiveness of the Music Mind Games curriculum for spawning my career as a composer. After many years of teaching the basics using the Blue Jello Cards, my rhythmic dictation got so strong that when I traveled to different countries I would transcribe different languages into rhythms in my head. 1- Speak cards (optional hand symbols). ​ 2- Sing in ascending scale. 3- Air bow while speaking/singing. 4- Play on an open string. 5- Play as an A major scale. * Add marching to any of these steps. 3- Play a different scale for each card. Pipe Cleaners & Music Theory/ Blue Jello Cards - Learn a cheap, hands-on, colorful and easy clean-up activity to support teaching music theory and the Blue Jello Cards to young musicians. The Magic Bag - a Metaphor for the Learning Process - Learn a "magical" way to create the identity of a learner in young students using the Blue Jello Cards. How do you teach rhythm and/or music theory in your studio? Let us know in the comments below before the next newsletter for a chance to win a set of Blue Jello Cards. 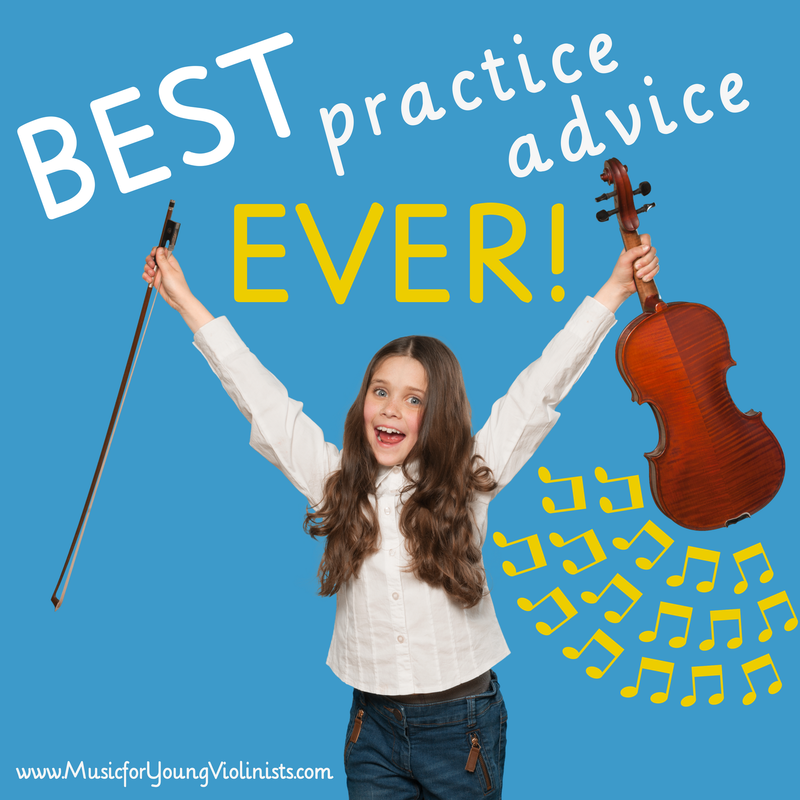 The Best Violin Practice Advice! Doing your best in life. Developing a brain with connected pathways for intelligence and creativity. What is your favorite practice advice? Please let us know in the comments below - Thanks! The ultimate bow hold bunny challenge!!! Way to progress violin playing skills while away from the instrument. How do you train mind-body connections in your teaching? ​We would love to hear any tips or tricks you have for this in the comments below thanks! I spent 1 week watching my students practice and it was one of the most profound things I have ever done in my teaching. I believe that if more teachers did this then we would be able to help more students reach higher levels in their violin playing. ​In this video and correlating blog post I explain how I organized a week of watching my students practice and why this was such a powerful use of time. The week prior to watching students practice I had told them to expect something very different at their coming lesson but I did not say what it was since I wanted to observe them in their "natural practice state" as much as possible. I was hoping to avoid students preparing for this observation since it would not be an honest representation of their work and defeat the purpose. On the following week I brought my computer to my teaching studio and reorganized the space so I could sit at my desk. After explaining that I would be observing them practice, I was silent and typed up a personalized report for each student while they showed me how they practiced. We reviewed the report together at the next week of lessons and went over suggested modifications to their practice routine. It was a heart-felt but shocking and humbling week. I also have always assumed that if something was not accurate then the student would isolate the issue and create a practice spot out of it. I was WRONG on this because over and over again I heard my students plow over obvious inaccuracies in their interpretation. ((((((Deep Exhale from Me)))) So, the other part of this humbling lesson is that I had first heard about doing this years ago but delayed implementing it. I regret this because had I done this in past years my students would absolutely be having a higher success outcome with their efforts. I will know at the end of April if I am accepted into nursing school. If so then this will be my final 9 weeks of violin teaching from a 20+ year career. Better late than never but hopefully by passing this along here you can carry the torch and watch your students practice to best serve them and nurture their gifts. It DOES NOT MATTER how great of a teacher you are and it DOES NOT MATTER how talented your student is. IT MATTERS how they interpret the lesson information and practice in their own space and time. The only way to check in on this is to actually watch them practice. We want to hear from you and know how you help your students reach their highest potential. PLEASE SHARE YOUR EXPERIENCE & WISDOM WHILE HELPING OTHER TEACHERS and WIN $100 Gift Certificate - Add to this conversation by sharing a comment on the blog or youtube videos. I will have Brecklyn Ferris of the Plucky Violin Teacher pick her favorite 3 comments at the end of April 2017 to each win a $100 gift certificate to the M4VY Store. How to view the situation in a positive light. BTW - Immediately after making this video the mother texted me a practice video of her daughter who was in the process of doing her assignment 110x that day! Wow, that is exactly why we never quit before the child! 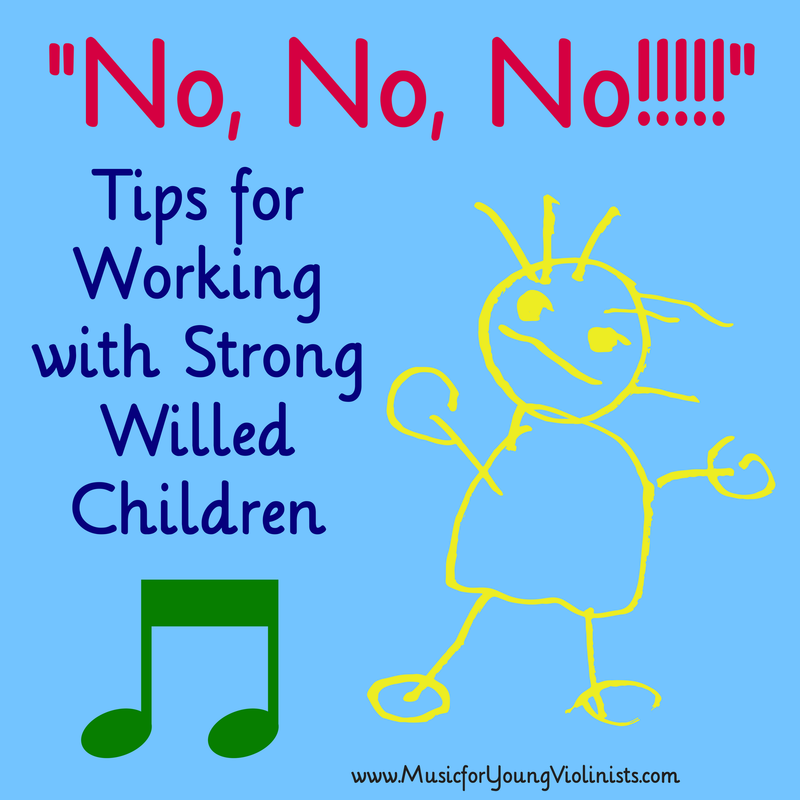 How do you help your child or student when they are expressing a strong "NO"? Please share in the comments below, thanks! 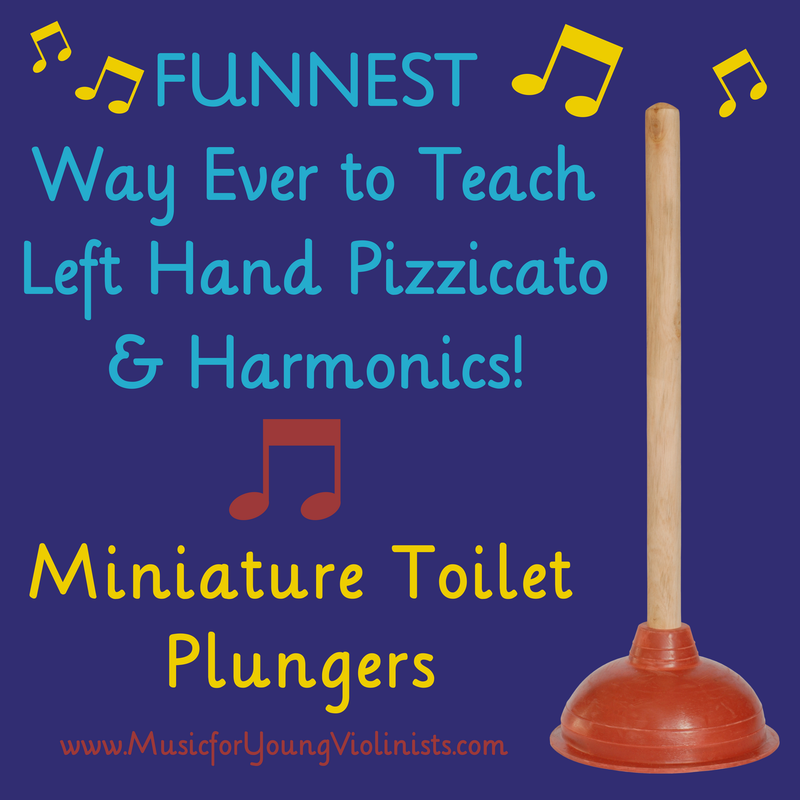 Most FUN Way to Teach Pizzicato & Harmonics! Funnest way ever to get great pizzicato or harmonics. "Hey? Where can I get these cute plungers?" They are called Party Plungers and on Amazon for about $9 (click this link to find). What do you do to add creativity and fun to your teaching? ​Please let us know in the comments below, thanks!